Day 71 (5/10/13) West of Kentwood to Franklinton. Thunderstorms and a call delayed my start this morning. But the skies cleared and it turned out to be a pretty nice day. The route continued to roll through Louisiana causing me to use more effort than I would like. My crew went easy on me and let me quit at the usual time despite the late start. Louisiana continued today with two attributes I noticed from my first day in the state. The people and the dogs are very intrigued with unicycles. The people stop and even turn their cars back around to ask questions and take pictures. I’m sure the dogs would take pictures too but have some lame excuse about opposable thumbs. Instead they just run alongside and in front of my wheel and bark encouragement to ride faster. Thunderstorms arrived conveniently for the crew around dinner time so we elected to eat out. We ended up at Mike’s restaurant in Franklinton. The table next to us noticed the truck and asked us about our trip. They were very friendly and helpful with advice where to camp. Then surprisingly they generously picked up our dinner check in support of our cause. Thank you Jackie McVey and party for your support. 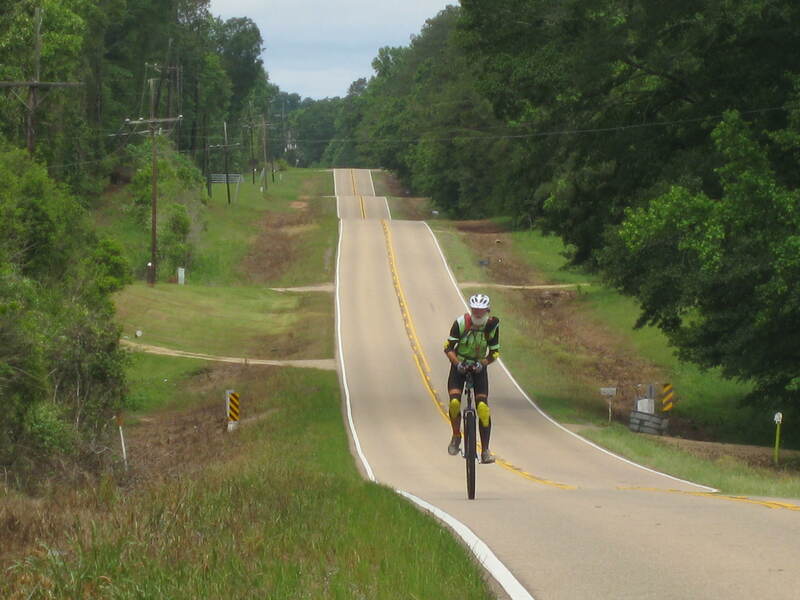 This entry was posted in Unicycle Across the Country. Bookmark the permalink.